You are at:Home»Sport»What is Ultimate Frisbee? Ultimate is a very young sport, with its roots in North America. It started back in 1968 when high school student Joel Silverman suggested the game to his student council at Colombia High School. This turned out to be a huge success and the first college game was played between Princeton and the Rutgers. The game has been growing like wildfire ever since with teams forming around the globe. 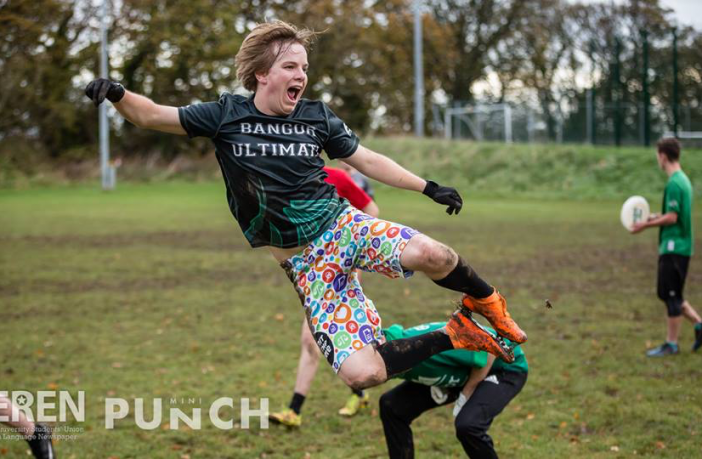 Already there is an official televised league in America, the American Ultimate Disc League (AUDL) as well as an international world series, which Bangor student Ed Simpson played for the under 24s team last year. So what is ultimate frisbee? The best way to describe the game is a cross between netball and American football. The field is split in two halves, each with its own end zone. Each team then tries to pass the disc down to their opponents end zone to score. The challenge is that you can’t move with the disc so constant passes between the whole team are needed if you want to win. If the disc hits the floor, goes out of bounds or is intercepted then it’s a turnover and the other team is now on offence. The sport is played outdoors with 7 players on a team as well as indoors and on the beach with 5. It is also one of the only sports which is primarily played as mixed. Other variants also include men’s, women’s and open. A big part of ultimate frisbee has always been the spirit of the game. It is the only sport played without a referee where players must discuss any decisions made such as fouls, goals and turnovers in a fair and honest manner. If no agreement can be made, the call is contested and the disc goes back to before the throw. After each game players of both teams will get in a circle of alternating team members to celebrate each-others highlights then quickly discuss how the game went, what the other team might do to improve for next time and how spirited the game was. Spirit is made up of 5 key factors: Rules/knowledge use, communication, fouls/body contact, positive attitude/self control and fair mindedness. During a tournament, each team will rate each other on the 5 factors and a separate award will be presented to the team which displays the best spirit. So what makes this sport so ultimate? The fast paced nature and wide variety of insane throws makes the sport exciting the whole way through. The highlight reels are always filled with things you wouldn’t believe possible! On top of this, it’s a highly inclusive sport. It’s very nature means a team can only be successful if everyone works together in their own roles. There is also no ideal body type for ultimate, anyone can be a pro. Sure it might help if you’re tall but it’s skill and determination which mark an all-star player. Most of all though it’s the people that make the sport what it is. Through spirit of the game, competitiveness is encouraged but it’s fair play that’s celebrated. Rather than yelling insults at each other, teams build lifelong friendships with each other. 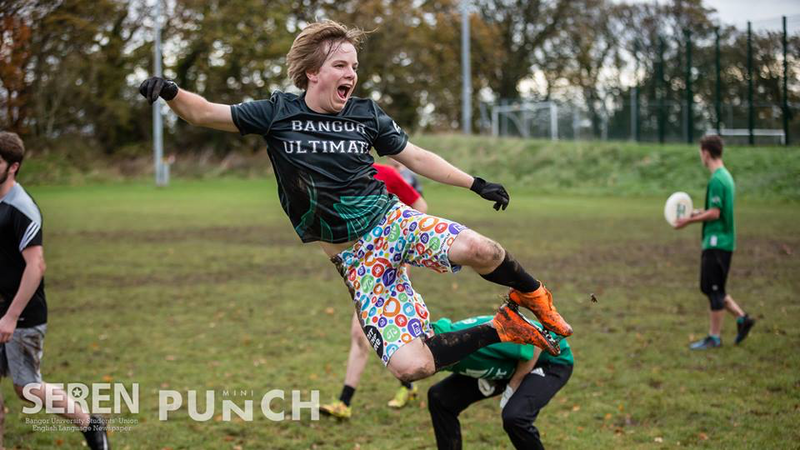 Bangor Ultimate are a small close-knit team. Everyone trains together, regardless of ability or gender. I think this best explains their success at beating uni’s with 5 times as many players. They know each others style, strengths and weaknesses so well that they know how to adjust every throw based on the receiver. They therefore accept players of every ability to train with them and help them to improve. An individual can then choose to just play recreationally all the way to internationally. They have helped train a number of GB players, most notably Rachel Turnten who this year won European youth player of the year. Their club still has Dom, Nat and Tabi all who have all played for the national team in the past. They are also very excited to announce that their very own Cheryl Ng has been announced on this year’s U24’s mixed beach team! You can find them training on: Monday 7-9am at Normal site Wednesday 1-3pm Normal site Thursday 8-10pm CB grass pitches They have had an amazing season so far, winning every BUCS match comfortably, winning mixed indoor regionals and coming second in men’s indoor regionals. Giving them guaranteed spots in Div 1 Nationals for both. Women’s regionals is this weekend, having high hopes for the ladies continuing this winning streak. Sadly, many of their players are graduating this year so they are always looking for new recruits. So if you have an interest at all in joining the fastest growing sport in the world, they’d love to have you!